It has been estimated that an astonishing eight out of ten adults in the developed world will experience low back pain at some point in their lives. Chances are you have been struck by this widespread condition. Or maybe you are currently experiencing pain in your lower back and you are researching your options. Just because this problem is very common—a lot of people suffer from lower back pain—does not mean that it is normal. You should not have pain and if you are experiencing pain, the worst thing you can do is ignore the problem. If you are dealing with low back pain, you are not alone, as we see a lot people in our chiropractic centers with this problem. 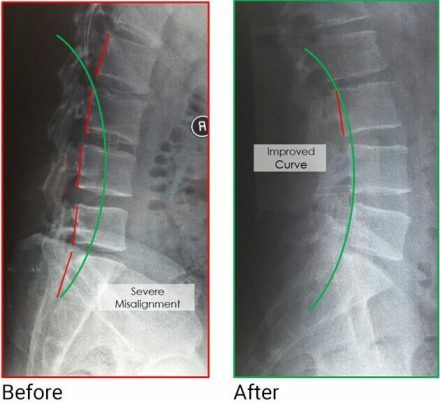 We have had great success in helping people feel better in their lower back by correcting the most common cause of this challenge— lumbar spine misalignments and the resultant damage to the surrounding structures. If you are like most people we see, you’re looking for fast pain relief. We can certainly understand that. It’s important to understand that the only way to achieve complete and lasting improvement is by correcting the cause. The structural alignment and the movement of your lumbar spine is the most important factor for the health of your lower back. Your back needs to be strong and the alignment of your spinal bones determine the strength of your spine. As seen from the side, your lower back (lumbar spine) needs to be curved. From behind your lumbar spine needs to be straight, and your pelvis should be level. When your lower back has this optimal alignment you will have good flexibility, proper posture, balanced weight distribution, very little muscle tension and limited low back pain. Good spinal alignment will also lead to healthy discs, ligaments and nerves in your lumbar spine. Because your nervous system controls all aspects of your life, the health of your nerve system is the ‘Big Idea’ in chiropractic. Simply stated: an aligned spine will be healthy, strong and resilient. 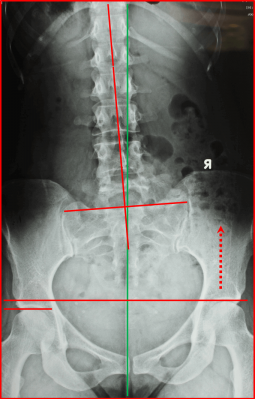 You can see a severe side kink and sharp shift in alignment as well as a significant distortion in this person’s pelvis. This misalignment condition is known as a subluxation in the lumbar spine. Subluxations will lead to irritation and stress on the nerves that are associated with this person’s lower back. Their muscles will likely become tight, stiff and inflamed. They may experience numbness and tingling into their thighs, knees and feet as well. Their lower back probably becomes stiff and achy as they sit at work throughout their day. Maybe they feel that their lower back is weak and they avoid strenuous activity. They are probably battling, aches, pain and tension on daily basis. As a result of these challenges they are not able to enjoy their life as much as they used to. Does this sound familiar? We help people with these types of problems on a daily basis in our chiropractic centers. Read more back pain success stories here. Is Your Lumbar Spine Out of Alignment? For some reason people in Singapore are very fixated on spinal discs. 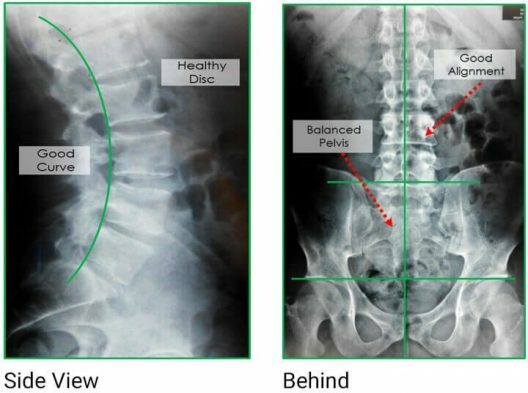 The discs of the lumbar spine are an important part of the structure of the low back, but not all episodes of low back pain are caused by spinal disc injury. It’s very common for people to come into our chiropractic centers after being misdiagnosed with a “slipped” disc by their medical doctor. Often the medical doctor does not perform the requisite tests for an accurate diagnosis. They simply give the person a label because they were in pain. We take a very different approach. We insist on a thorough examination before any diagnosis can be given and certainly before chiropractic care can commence. A complete chiropractic spinal checkup is the essential first step in determining the cause of your low back pain. Always ask your medical doctor what has caused your pain or health problem. If they do not know the cause then they are, at best, guessing at the solution. Gambling with your health is a dangerous proposition. While spinal surgery may be appropriate in emergency and very severe situations, it should be viewed as an absolute last resort. Surgery should only be utilized if other options have already been exhausted. There are numerous risks when it comes to spinal surgery and you should never agree to an invasive procedure until you have done thorough research. Often the complications caused by spinal surgery can be permanent. It’s always better to start with a more conservative approach first, assess how that works for you, and then alter the approach as needed. Chiropractic offers a non-invasive, safe and effective alternative to aggressive treatments. Have your spine checked by one of our qualified Doctors of Chiropractic to see if chiropractic is right for you. 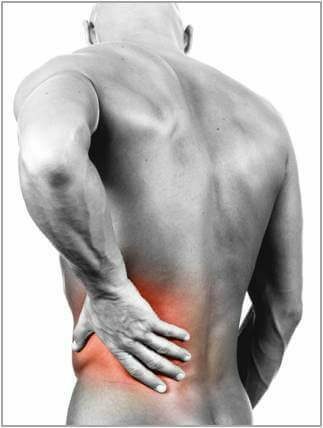 What Causes Lumbar Spine Problems? Household chores like mopping, cleaning, vacuuming, gardening, etc. So if you are dealing with pain in your lower back, what should you do? The first step is to always have your spine checked to understand what is causing your pain and to see if chiropractic is the right approach for you. If you do have a physical misalignment (subluxations) in your spine causing pain of some kind, then you can definitely benefit from chiropractic adjustments. Chiropractic adjustments are the only way to correct spinal misalignments. We have helped a lot of people suffering from low back pain with natural chiropractic care. The x-ray on the left (outlined in red) shows the significant misalignment that was present when this person first came in to see us. They were experiencing severe low back pain, sharp shooting pain into their thigh and calf muscle. They could not sit for very long and it was very difficult for them to get out of the car. Gradually, over time they had to give up sports and activities due to the worsening pain, until one day the pain flared up so severely they finally decided to seek help. Clearly, they were facing a lot of challenges in their life. On the right (outlined in green) you can see the results after being adjusted for a short time. We achieved significant improvement in their alignment with a series of chiropractic adjustments, exercise, stretches and guiding them to eliminate some of their bad habits. They also had a number of health breakthroughs as they were feeling a lot less pain, the pain in their thigh and calf muscle disappeared, they had more flexibility in their spine, more energy, and they were sleeping better at night. At the point of the re-x-ray, we still had a lot of improvement to look forward to as well. Healing is a journey. The alignment of your spine affects many aspects of your health because your spine affects your nerve system. The x-ray on the left (outlined in red) also shows a very severe subluxation pattern. This person was experiencing severe muscle tightness in their low back and sharp pain in their right hip. They had constant knee pain to the point that they had to give up running and playing tennis. They used to be very active, but because if the pain, they were forced to stop all sports and become sedentary in their life. As a result, they were gaining weight and losing their fitness. 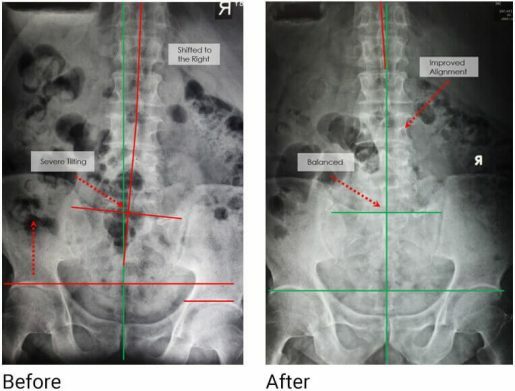 The x-ray on the right (outlined in green) clearly shows a drastic improvement in their spine alignment. Again, this was achieved with a series of chiropractic adjustments and home exercises. The low back muscle tightness reduced significantly, their knee was a lot less painful and, most importantly, they were able to go back to running, playing tennis being active. Amazing health breakthroughs are possible with an optimal spine and nervous system. There is no reason to continue dealing with and living with these health problems.Chiropractic has a long track-record of helping people with many types of pain and symptoms. Schedule a no-obligation spinal checkup to find the cause of your low back pain. It all starts with a checkup. Make a change today!